I'm an ornament-o-holic. There I said it. I have way way way too many Christmas decorations and my problem seems to be getting progressively worse. You see, I get intrigued by the "it" colours of the season, chartreuse and citrus colours one year, whites and silvers the next, and then I'm drawn to different styles - traditional reds and greens; vintagey kitchy things, or the rustic tones of birch, pinecone, and greenery...which means I've built up a collection of holiday decor items that has no rhyme nor reason. I can't be the only one. Do you put out all your decorations? 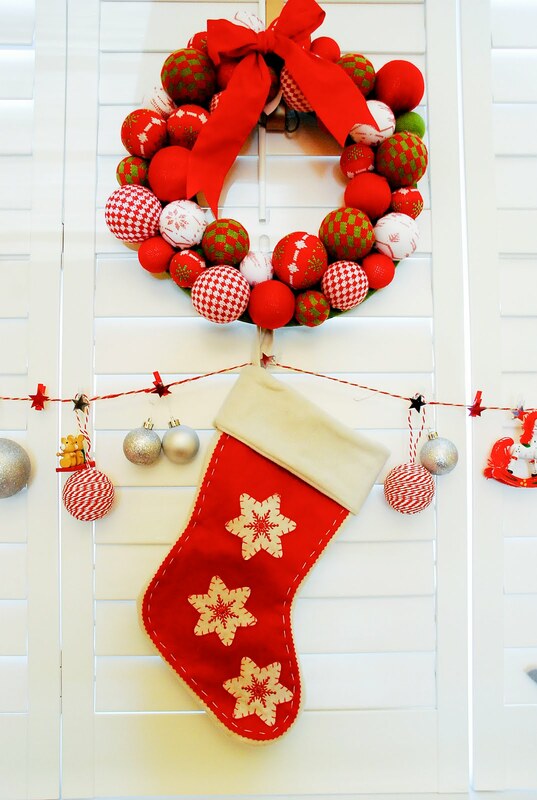 Or are you careful to edit and have a clear colour palette for that year's decor? Me, I must put everything out. I mean I get to see these decorations only once a year so I want to bring everything out and enjoy it. ...and a vintage red & white scheme right beside it. I don't have a mantle so I've strung our stockings on the shutters. I love the skate stockings which I found at Chapters/Indigo. 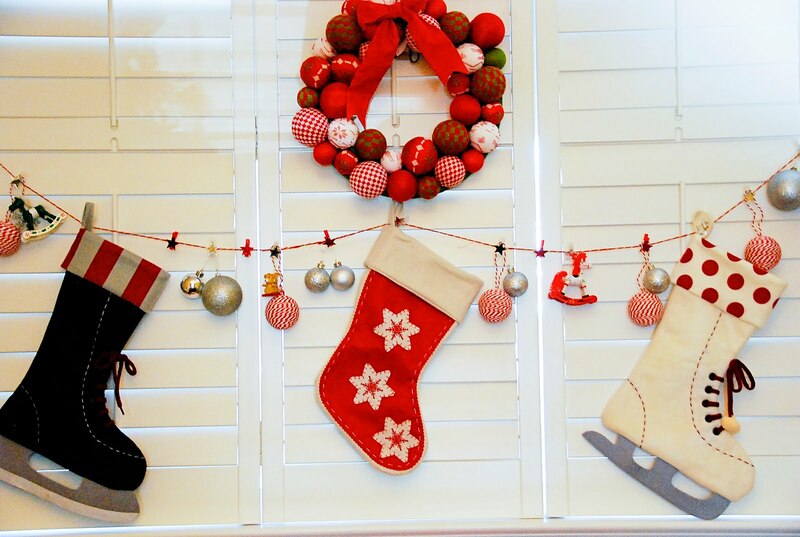 The rest of the red & white decor is a mix of Ikea ornaments and the vintage ornaments HandyMan rescued for me. 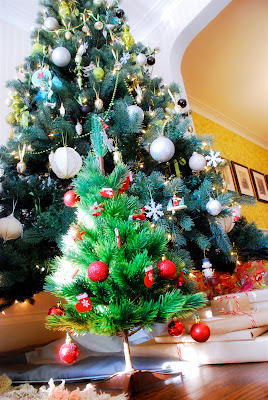 After I decorated the tree, as you can expect, the little one became fascinated with all the sparkly ornaments. She was pretty good at just looking at the ornaments and not touching too much. I would let her hang up any of the ones that had fallen off... and, well, you know what that lead to... her pulling ornaments off, dropping them on the floor, and saying "Uh oh" just so she could have the chance to hang them up again. Smart kid, haha. So to save my ornaments and faux branches from further destruction, I gave her her own little tree, complete with indestructible felt and plastic baubles. And we are a happy, jolly household once again. Beautiful tree! And the little tree is adorable. We gave out little one her own tree a couple years ago for the same reason. Now this year is the worst if you can believe that, she will be 5 in a few months. She really wants to have her way with the big tree. I love the idea of the little tree! That is super cute! I love that you put out everything! You are right - Christmas only comes once a year so we might as well enjoy what we have! The tree looks great Jennifer. Love the colouring. What a great idea - giving her her own tree. Dmitri has taken off most of our ornaments...haha! Being a skater, I LOVE your ice skate stockings, thanks for posting the link! A little tree is a good idea! Our 3 year old loves to pull off the ornaments to get a closer look at them, and he often drops them. So the top half of our tree is all of our fragile ornaments, and the bottom half is everything that's a little less breakable... Looks weird but at least my fragile stuff is staying safe this way!! The little tree is so cute! By the time I am done commenting you donate a million cans! Just kidding but great idea! Oh, I remember this inquisitive age - so much fun! A child size tree is the perfect answer. I get carried away with ornaments too and tend to keep buying each year. Like that you use everything you have! I had a purple Christmas phase a ways back. Those have to stay in storage now. I am so tempted by the new pretty colors, but am sticking with silver and gold. There should be a support group for us. I'm going to start one... maybe we can pool decorations to avoid duplicates.. although I have a feeling we'll just end up hitting winners together :) your home is wonderful! Love those skating stockings and your sparkly tree. A timely posting...I just got back from PIER 1 an hour ago. Oh, hey, GUESS what I bought?! ..and I don't even have a Tree!! Meanwhile, my Sister on the other hand - she's *ONLY* putting up THREE Trees This Year, since The Kids won't be IN Town! She usually has one in EVERY Room! I love your big tree, Chloe's tree, and the way you did your stockings--so clever. I have to say that I have never been a fan of themey trees. We put all the same ornaments on our tree year after year, adding one or two that represent something that happened that year. For instacne, a silver wire Eiffel Tower was added one year after we had a trip to Paris. Another year's new ornaments represented the birth of our first child. This year, we are adding a small wooden ferry ornament to remind us of two family vacations we took this summer that both involved ferrying to nearby islands. And our son will surely bring home an ornament crafted during his first year in kindergarten. We like to be able to reminisce when we open the ornament storage boxes every year. I would never sacrifice that to have an "in" tree. OMG! Those Skate stockings are the cutest!! 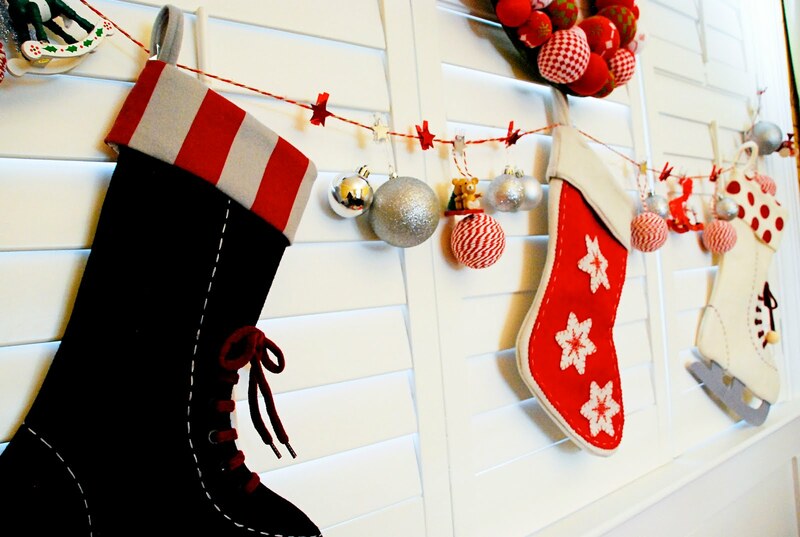 Your tree and stocking swag look fantastic. I have the eclectic taste thing happening as well - sigh. I'm Chloe has her own tree to decorate and undecorate at will. Your tree & all your christmas decor is beautiful! 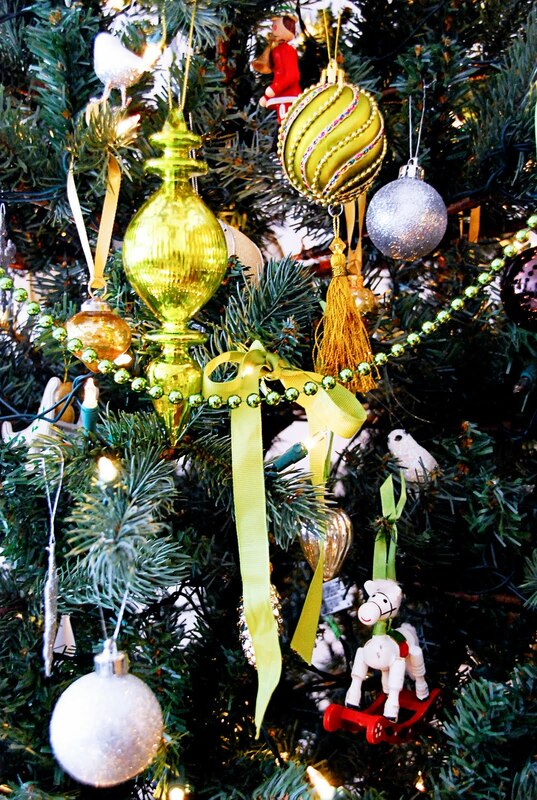 I hear that Martha has a tree in every room- with that strategy you could use every ornament theme on a different tree! Seriously though, I like to try to spread the holiday decorations through the house, and why not have different holiday color schemes in different places? 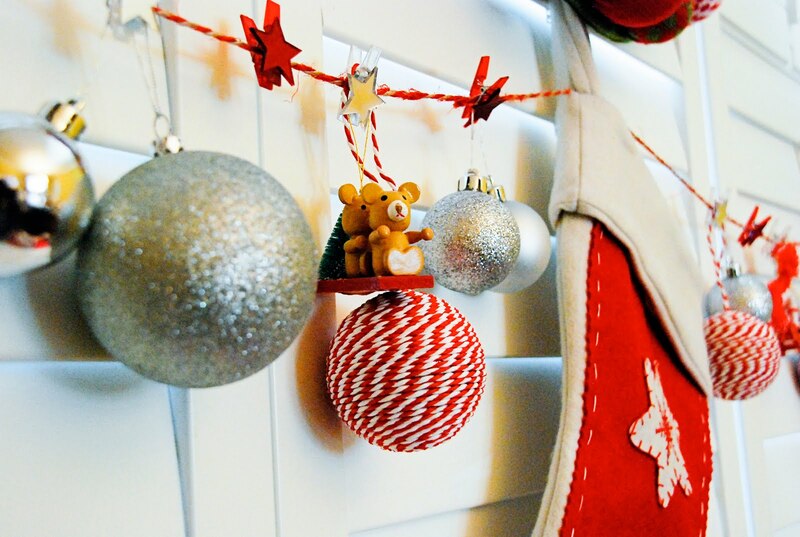 You could hang a flat tree on the wall(a felt blanket-style one with loop hooks), or ornament bunting made with ribbon/twine (to hang things up high) in places where there isn't a lot of space. 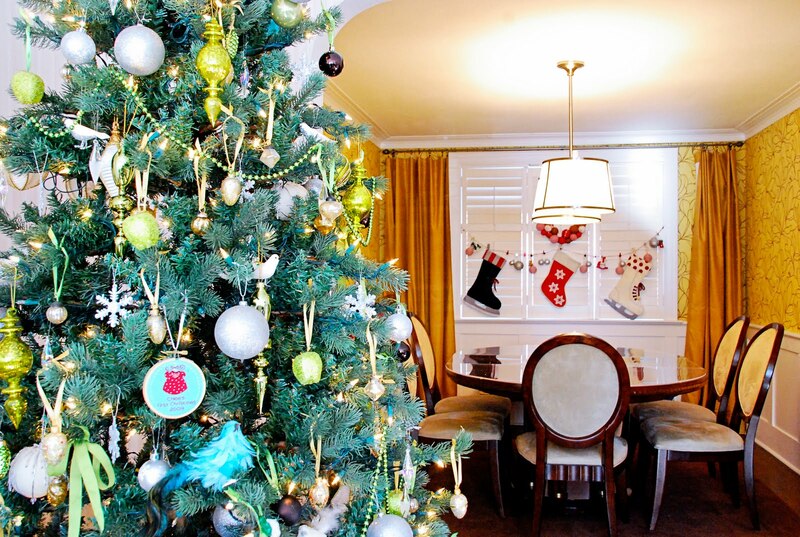 Your rooms could each host a different holiday "look". PS- Love the cans for comments drive! Please count me in! 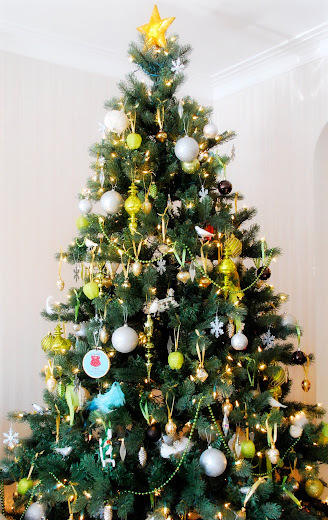 Love the "Mini-Me Tree" idea! Our "small" is still good at a) being so in awe of the tree as to just look; b) touching the low branches and ornaments very, very gently. I'm still starting my decoration collection, so the tree isn't crazy yet. There are two themes: woodland animals and birds, and I limit myself to a couple additions each year.